Craft beer is blowing up and the 3rd annual San Diego Winter Brew Fest is your chance to try local favorites and new brews all in one place. This year, the now 2-day festival returns to the Hall of Champions in Balboa Park on Friday, February 20, and Saturday, February 21. Sample nearly 100 craft beers from over 40 breweries while enjoying live music and good times, all at an amazing location. Because we love our readers so much, SanDiegoVille is giving away a pair of passes and also offering a $5 discount on GA tickets by entering promo code SANDIEGOVILLE15 at checkout. Has the mild San Diego winter brought you down? Do you frequently wish you were shoveling your driveway? Do you long for the days of icy steps and layers of clothing? Let's all drink some beer, forget our lack of seasons and embrace our beautiful city! A celebration of craft beer from San Diego and beyond, Winter Brew Fest guests will get the chance to sample the best craft brews, including limited releases, while enjoying live music by Euphoria Brass Band on Friday and Todo Mundo on Saturday. Headshine will open for both bands both nights. A special menu of sandwiches, tacos and more will be offered by the on-site cafe. Participating breweries include Acoustic Ales, Ballast Point, Barrel Harbor, Drakes, Figueroa Mountain, Firestone Walker, Goose Island, Green Flash, Groundswell, Helm’s, Julian Hard Cider, Lagunitas, Mike Hess, Mission, Ninkasi, Oskar Blues, Pizza Port, Saint Archer, Stone, URBN St., White Labs and many more. A full list of brewers pouring each night is listed on www.sandiegobrewfest.com. 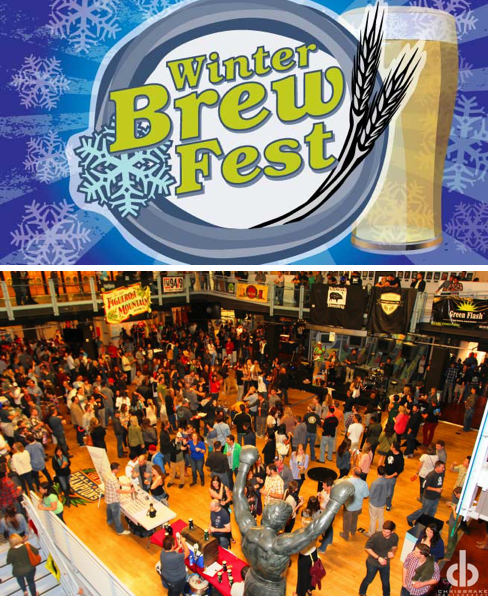 General Admission (7-10pm) tickets for the San Diego Winter Brew Fest are $40 in advance and $50 the day of the event. VIP tickets are $50 in advance and $60 the day of the event, and include exclusive limited admittance, early "power hour" admittance (6-7pm) with a special Cabot cheese and beer pairing. Tickets can be purchased online, and SanDiegoVille readers save $5 on GA tickets by using promo code "SANDIEGOVILLE15". This event has limited capacity, so be sure to get your tickets early. There will also be a limited amount of non-drinking tickets available at the door only. With roots in Denver, event organizers RightOn Productions, LLC, have been putting on brew festivals since 2004. 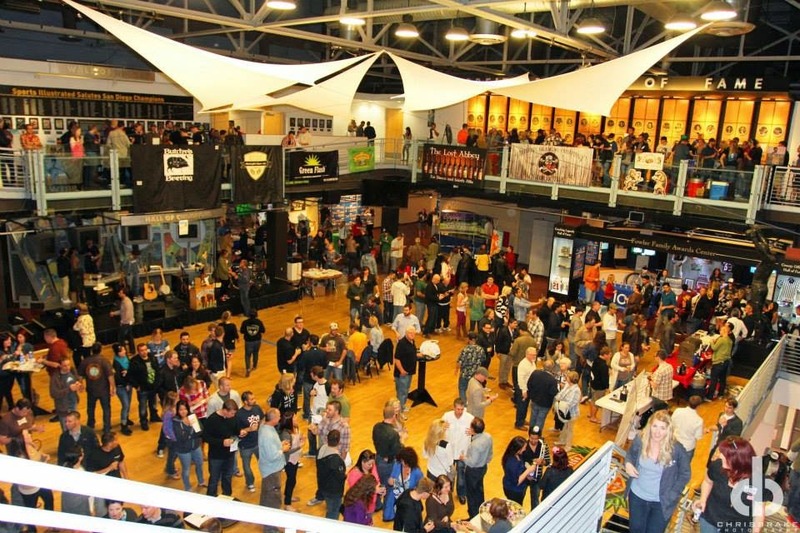 "With close to 100 breweries in San Diego, the Winter Brew Fest creates a fun environment to try a variety of brews all in an interesting setting," said Carolyn Hassell, Managing Partner of RightOn. "In addition, the donations the fest makes to the benefiting non-profits, Outdoor Outreach and SDMBA (San Diego Mountain Biking Association), make a significant impact in their programs." The San Diego Winter Brew Fest benefits Outdoor Outreach, a company whose mission is empowering at-risk and underprivileged youths to make positive, lasting changes in their lives through comprehensive outdoor programming. The festival also benefits the San Diego Mountain Bike Association (SDMBA) - a nonprofit, volunteer organization representing the interests of off-road cyclists and other non-motorized trail users in San Diego County. SDMBA's goal is to unite mountain bike riders, retailers and manufacturers to speak with a coordinated and responsible voice in dealing with other trail users, land managers and policy makers. Don't even think about driving to the Winter Brew Fest. Get a free ride to and from the event. SanDiegoVille has partnered with Uber and Lyft to get users a credit for their first ride. For Uber, use promo code SDVILLE and receive a $30 credit for your first ride, and for Lyft, use promo code SANDIEGOVILLE and receive a $10 credit for your first ride. Hall of Champions in Balboa Park is located at 2131 Pan American Plaza. Visit sandiegobrewfest.com and follow the Winter Brew Fest on Facebook and Twitter for more information.